Most of the time people buy roses because they are beautiful and they intend on conveying that beauty onto another that they feel the same way about. The colors of roses all have a meaning and a certain significance however and it is not often that I come across folks who actually know what many of these meanings are. Of course everyone understands the significance of red roses symbolizing love, that's an easy one. How many of you know what purple rose historically has signified? The meaning behind giving someone deep purple roses is often meant to symbolize love at first sight. Purple roses are manmade creations that do not have the long and established history as say the red, pink, or white roses, but that doesn't make them any less significant. Purple roses have not often been associated with a long lasting love however if you have encountered someone who has simply taken your breath away and made you fall head over heels for, well then the purple rose would be a proper choice for you to give to him or her. Purple roses are also often used to convey feelings of majesty, glory, and opulence. It is not uncommon to find purple roses displayed around royalty as well. Lavender roses for instance are a more subtle shade of purple and is the color that you will often see priests adorn themselves with during lent. Sometimes the lighter purple colors are used to signify control, or the need to handle a situation slowly or cautiously. Most often you will see deep purple roses given as an alternative to the more traditional roses that normally speak of love and affection. 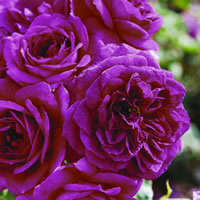 The Ebb Tide floribunda rose is one such example of purple roses. It produces blooms in a smoky deep purple color that average about 4 inches in diameter and give off a very strong spicy fragrance that smells a lot like cloves. They form in clusters of blooms that tend to be quite full, containing as many as 35 petals per bloom. This purple rose is a repeat bloomer and will bloom in flushes during much of the growing season. The Ebb Tide rose is a little more compact than other varieties, only growing between 2 and 3 feet tall, making it ideal for smaller gardens and even containers. 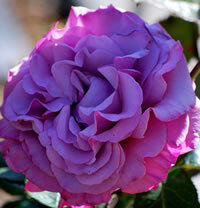 The Wild Blue Yonder rose is more of a mauve color but it is often included in most directories of purple roses. This rose is a grandiflora rose that grows upwards of 4 to 5 feet tall and produces rather large clusters of blooms that average about 3 to 3.5 inches in diameter. 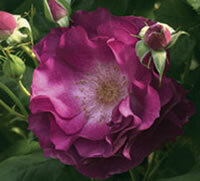 The Wild Blue Yonder rose also has a strong fragrance that has hints of both spice and citrus scents. This variety is tolerant of hotter temperatures than other varieties allowing it to thrive where others cannot. 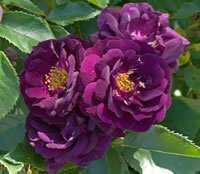 The Midnight Blue rose ranks up there among my favorite among the deep purple roses. While the blooms tend to be smaller on average than some varieties, less than 3 inches in diameter, this rose produces a large number of absolutely striking deep purple blooms in large clusters. Like the Ebb Tide rose, the Midnight Blue also has a very strong fragrance of cloves. The flowers will have a nice dark purple color fading away to white in the very centers. The reverse of the petals will be of a lighter purple than the fronts. This is one of those purple roses that you are likely to fall in love with instantly. The Neptune rose is a great hybrid tea rose that was introduced back in 2003. It is a lighter purple rose that produces really large blooms that average 5 inches or so in diameter and are very full with as many as 45 petals per bloom. They have a very sweet smelling fragrance that smells like citrus. The buds form in a deep purple and then open up to the lighter blooms. The Neptune rose is a repeat bloomer and will offer you sweet smelling roses several times over the growing season. The Night Owl rose is a great purple climbing rose that will easily reach heights of 10 to 14 feet tall if properly supported. One of the great traits about the Night Owl is that it is very nearly thornless, making it a joy to grow and maintain. 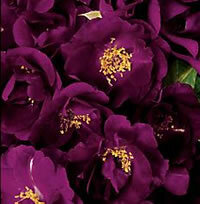 It is among the deep purple roses that boast a clove fragrance, although one not quite as strong as many of the others. The roses are a darker purple at the edges and gradually get lighter until they are near white at the very centers. The Night Owl will produce on average 4 inch blooms that form in nice sizes clusters and this variety is also a repeat bloomer. The varieties of purple roses I've outlined above are just a small sampling of the roses that are out there. You will notice that there are certain common traits among them such as the repeat blooming. If you are going to grow any of these varieties, you should make sure that you have a spot in your garden that gets full sun light for much of the day. It take a lot of light to produce all those blooms and a good rule of thumb is 6 to 8 hours of direct light every day. It is also preferable to give them a spot that gets the morning sun light as this is most helpful to dry up the morning dew that clings to them and can make them vulnerable to certain diseases. The location should also drain well after a rainfall or watering. If your purple roses spend too much time in soggy soil, this is also another invitation not only for diseases, but for pests as well. In time we will have articles on these individual roses to give you more in depth details. Keep an eye on our rose category pages for these articles if interested, as our content is constantly being updated.